Even though I’ve spent the majority of my life living within a 20 minute drive to a border, I still find it amazing how quickly one can drive in Europe to a completely different country. We are in Wales right now (at a gorgeous cottage, on a working dairy farm) and had the opportunity to meet up with another travelling family for lunch. In under an hour in our car, we were in Southern England and a few minutes later – in the stunning city of Bath. We haven’t visited a place that has the same feel as Bath before. The town is rather monochromatic (due to the heavy use of Bath stone in the construction). What the buildings lack in colour though, they make up for in detail. This was especially true in the Bath Abbey. I’m not sure which I enjoyed more, the stained glass windows or the ceilings. 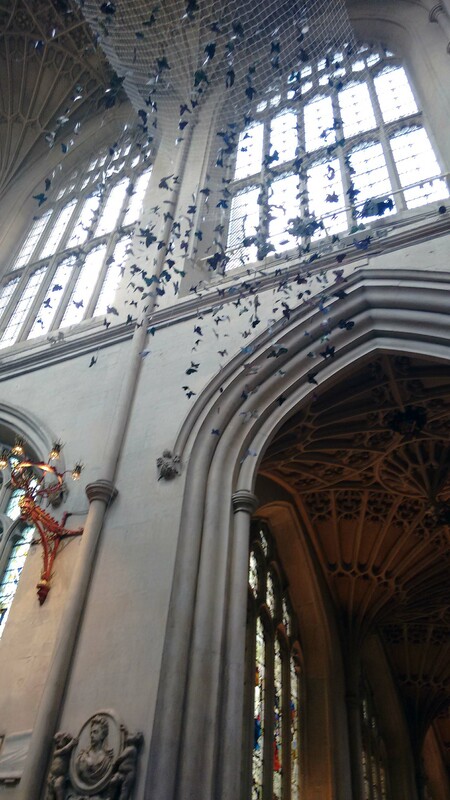 Within the Abbey, there is a display of butterflies that particularly moved me. This installation is meant to represent the beauty and diversity that is caused by migration. Visitors were invited to pause here, light a candle and pray in particular for refugees, involved in a forced migration. After our lunch with the (lovely) Jones family, we made our way over to the Roman Baths. I suppose our biggest disappointment with Bath overall was that only adults are allowed to use the Spa in town. We all love hot springs, and would have enjoyed spending some time in one. However, we did get to walk through the Roman Baths and listen to the audio tour. Seeing turquoise water always gives me a thrill. It was particularly beautiful here in the baths. We spent more time that afternoon wandering around the streets, touring the market and of course… stopping to eat sweets and drink coffee. Late in the afternoon, we decided to walk down to the weir to see if we could get onto a boat tour. The one our boat trip took us five miles down the Avon River to the town of Bathampton. Apparently there are many (many) Avon rivers in England and throughout the world, because the word Avon means river. 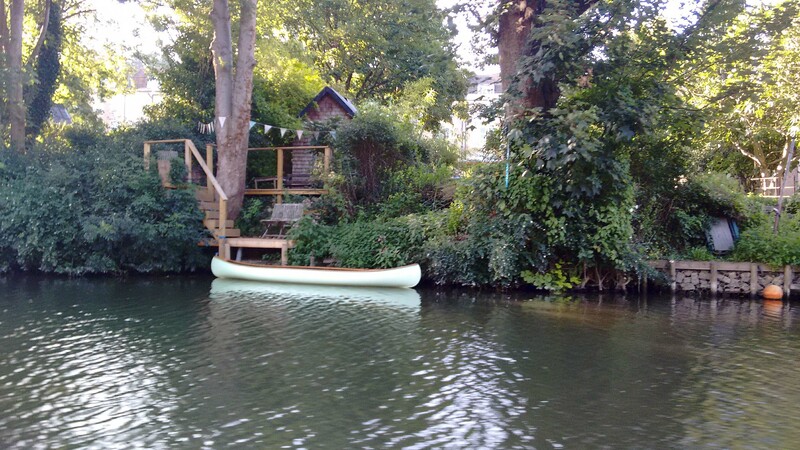 While we were riding on the boat, my Mom asked me if it reminded me of riding on the Sydenham River back home. It did. It was a gentle ride, surrounded by trees. When I realized the night before, that Solsbury Hill overlooked Bath – well… I had a “mushy, tingly, sparkly, warm gush moment”. I went back and re-read what I wrote a little over a year ago about my evening on the Pier in Crystal Beach… listening to that song as we were preparing to get ready to leave our life in Canada. We had just the first bit of our trip planned at that point. We had no clue how it was going to work out… but we set out to do it anyway. Travelling has been hard, magical, messy, tiring and invigorating – sometimes all within the same moment. It hasn’t all be perfect and some of it has aged us (ok… it has aged me… I’m not sure about Marcus). And every single hard, magical, messy, tiring and invigorating moment has been a moment I’ve been grateful to live, and share with my family.